A 23-year-old man spent 9 months in Kenya. He reported taking doxycycline for prophylaxis while in Kenya, however he poorly adhered to this daily regimen. Upon his return to the United States, he saw a doctor due to fevers. 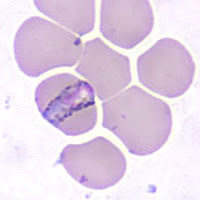 It was determined from the patient's blood that he had a low platelet count and a normal liver function. 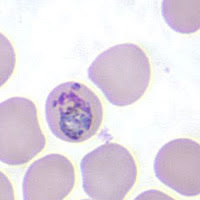 Blood films were made from a finger stick, stained with Giemsa, and examined. The objects below were observed in the thick and thin blood films under oil immersion 1000×. Drop in your answers in the comments section -with the diagnosis (species level identification) and based on what criteria is ur identification. 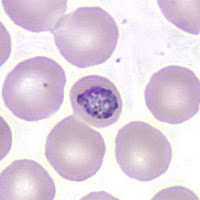 Plasmodium malariae , based on the size of infected RBCs ( not enlarged) which rules out P.vivax and P.ovale, characteristic band-form trophozoite in the third pic and the geographic location.